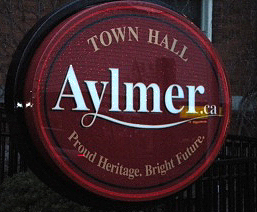 There are five places called Aylmer in different parts of Canada and one in the north of the US. I presume that they were named in honour of Lord Aylmer, the Governor of Canada from 1831 to 1835 – find out more about him on the Fighting Aylmers page. Aylmer, Quebec, is part of the city of Gatineau, on the banks of the Ottowa River approximately 15km west of Ottawa itself. Recent development has apparently stripped out much of the green heart of what is now essentially a 40,000-citizen suburb of Ottawa. Lac Aylmer in Quebec, around 80 miles south of Quebec city so not particularly near the town above; much smaller than the Lake in NWT referred to below, but it seems a pretty place, as the French language site of the small town on its shores Beaulac-Garthby shows. 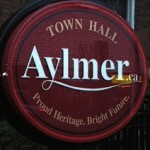 Aylmer, Ontario, is a small town of 7,000 people about 15 km south east of London close to Lake Erie. It has its own e-newsletter. Pilots know it as a VOR station, location N42.42.40 W80.53.27. In 2003 the local meat packing plant was alleged to be processing meat that was dead before it arrived at the abbatoir. This became a local scandal, costing the local Conservative politician her seat, and later the firm was heavily fined for illegal discharge of effluent. The town was formerly a major centre for tobacco processing, but its last plant was due to close in 2007. Lake Aylmer in the North West Territories – an exciting place, good for wolf watching. 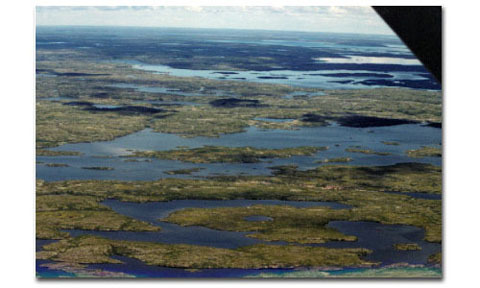 The Lake is more than 60km both east to west and north to south, area some 900 sq km, in shape something like a horseman. At around 300m elevation, it is well above the treeline of the Canadian tundra. There are no towns hereabouts – the territory capital of 18,000 souls, Yellowknife, is more than 300km to the south west – and its remoteness is an attraction to many. Aylmer Lake Lodge is sited at the eastern edge of the lake. Its owners provide “world class lake trout and arctic grayling fishing”, and run inclusive trips including air transport from Yellowknife. Mt Aylmer in Alberta, a 10,000ft peak in the Rockies. Sometimes I dream of making an expedition to the peak so it has a page of its own. 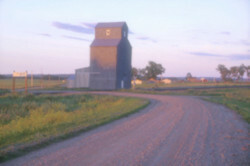 Aylmer in North Dakota, a small town (= city in US) of about 6,000 people about 100 km north of the state capital Bismarck. There is little on the web about this Aylmer apart from the picture on the right and listings of estate agents, lawyers and even a psychic. More information please! Finally, there is a district in Jamaica called Aylmers: see The Aylmers of Jamaica for more information.